Mercedes-Benz recently awarded i.M. 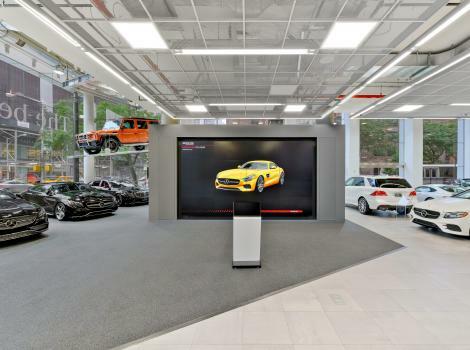 Branded the graphics and millwork contract for nearly seventy AMG Performance Centers to be built in select AMG dealerships across the country. To kick off the initiative in style, Mercedes-Benz tasked i.M. 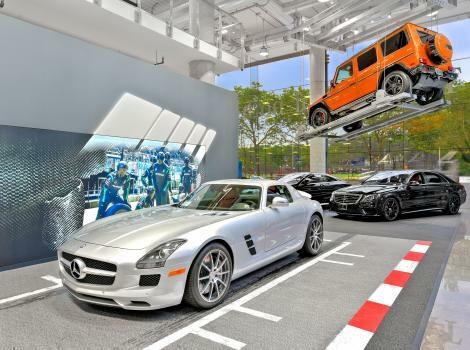 Branded with installing the first AMG Performance Center at their iconic and highly visible, New York City dealership. 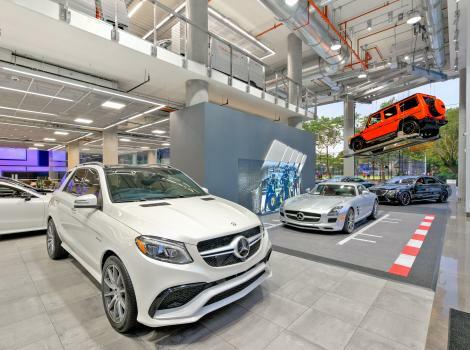 Located at 11th Avenue and 54th Street, Mercedes-Benz Manhattan is an expansive 330,000 square foot facility that in an average year, delivers more than 5,000 vehicles to New York City’s most performance-conscious automotive consumers. 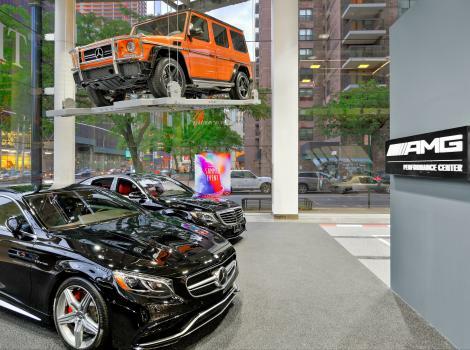 Mercedes-Benz Manhattan is the only Mercedes-Benz retail location in Manhattan as well as the only Mercedes-Benz dealership in the country owned and operated by Mercedes-Benz. Over the course of two weeks, the i.M. 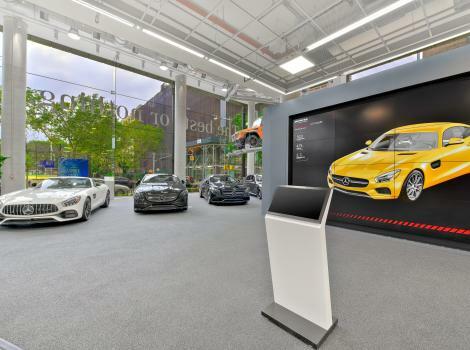 Branded team orchestrated a seamless AMG Performance Center installation, leaving a lasting impression on Mercedes-Benz, local dealership personnel and most importantly the AMG performance enthusiasts who have had a chance to visit this “showroom within a showroom” at the Mercedes-Benz Manhattan location. 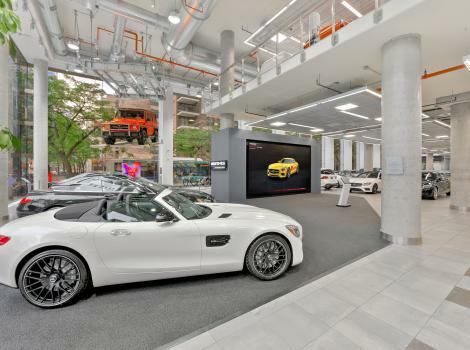 This flagship boutique dealership delivers an uncompromising selection of new and hand-picked preowned Mercedes-Benz vehicles, smart cars, and Sprinter Vans to patrons throughout New York City and beyond. With constant customer foot traffic at the dealership and unique challenges of downtown New York City logistics, it was imperative that i.M. 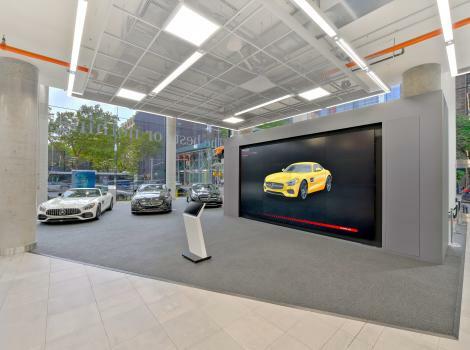 Branded deliver a timely installation with minimal disruption to the dealership’s day-to-day operations. i.M. Branded specializes in meeting these objectives and was able to meet and exceed Mercedes-Benz’s expectations. Mercedes-Benz Manhattan ranks #1 in the region for sales volume. The dealership focuses on providing outstanding customer service and helps ease the pressures of downtown New York City traffic congestion for customers by providing pick-up and drop-off service. For more information about Mercedes-Benz Manhattan and their AMG Performance Center, visit www.mbmanhattan.com.